ABC Bartending Schools has a bartending school in Las Vegas, Nevada and is the largest privately owned bartending school system in the United States. The Director of ABC's Las Vegas campus is Greg Abate. Greg has a BA degree from CCSU, two years graduate work at NYU, and over 33 years of experience which includes managing his own restaurant for 4 years and his own night club for almost 15 years. 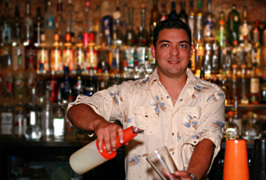 Greg started teaching for ABC Bartending Schools in Ft. Lauderdale before opening the school in Las Vegas. His considerable knowledge of the industry is passed on to our students to keep our nationwide reputation of training the most efficient bartenders in the country. Larry Riley, our current night instructor and placement director has been in the industry managing bars and restaurants from New York to Las Vegas for over 30 years. He has been teaching the night class for over 10 years and his unique style and personality are well received by all of his students. He is also responsible for compiling a job lead list, which is updated every Tuesday after 12 Noon. Karen Abate, our admissions director has been working with us for over 16 years. She has bartended in upstate New York, Florida, and managed a bar in Connecticut for over 12 years. Her congenial and friendly demeanor helps our students find what class times they need and gives important information on the phone and at the school. If you are 21 years old or older, you could become a professional mixologist with just 40 hours of training! Tony Sylvester has been placing bartenders nationally since 1977 and brings to his schools the art of matching the right face to the right place. Take a look at this job placement list for the Las Vegas, NV area, and the nationwide chains that have hired our students.